The trouble with many accessories is that you can only find a use for them every once in a while. Sunglasses out of the bright sun might look cool, but only until you start stumbling into stuff. An umbrella is certain to unleash a curse indoors. But, the right hat can be a game changer. Pull down the brim to dodge the wind. Let some breeze in to cool the head but keep the sun off it at the same time. Fit in whether you're in the old west, at the farm, or even go on a grand adventure as a superpowered pirate! Give your kiddo just the extra edge they need to complete a fantastic look. 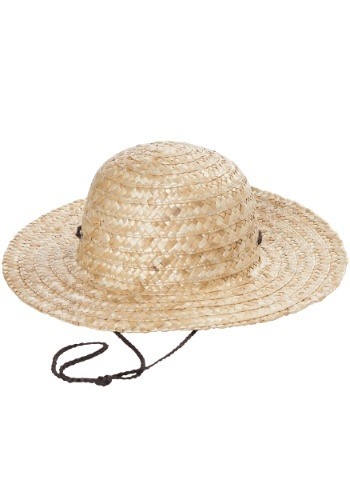 This Child's Straw Hat is securely made and breathable so your tyke won't overheat. The chin string can hang loose or be looped tighter to keep it from blowing away during those gusts or races they're about to win. A good hat finishes a great look. That's always true. The only question is what look this Straw Hat is going to complete! Will your kiddo be adventuring in the frontier of the wild west or taking to the oceans as a pirate on a quest to become the king of the seven seas!? I needed this for an ACTUAL child! I even paid extra shipping to get this in time for Halloween. It shows up and fits my head because it says 16+. Since when is a 16 year olds head not the same size as an adults head??? Waste of money and time! I'm sorry that didn't work out for you Katie! We appreciate the feedback on the sizing. I was very disappointed when receiving this “child’s hat” because the tag says “ages 16+” and fits my husbands head instead of my child’s head. Needed this for Halloween this weekend and now we will have to figure something else out.